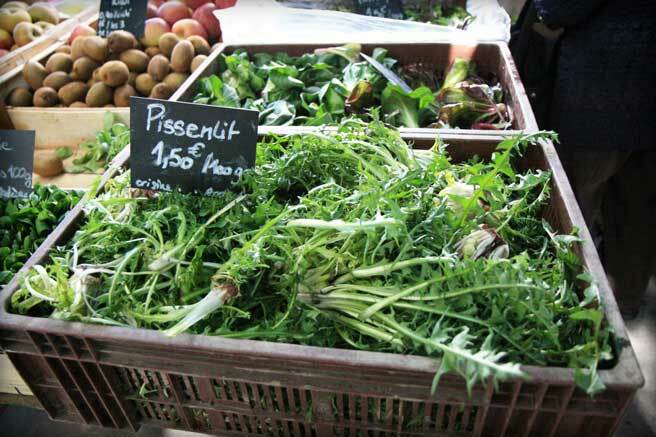 At about this time of the year in Lyon, we always see an assortment of various foraged or otherwise uncommon greens making their appearance at the markets, a kind of bridge to the bounty, taking us on a little joyride past the precocious radish. When the weather warms up, people go out searching for a burgeoning explosion of cute little vegetables, and the reality is that yes, while the weather is indeed warming, we can't expect miracles. Things need time to grow. We saw stinging nettles, bins full of dandilions, aka pissenlit, given this name for their long held reputation as causing children to wet their beds, and some scraggly turnip greens lopped from last year's plants. While they looked a bit ragged around the edges and gone to seed, I had a hankering for some. When did you last have a nice plate of fresh turnip greens? People were asking how to cook them. The lady was telling them they should put them into soup. I could already taste them tossed with the bacon I had, the good bacon that I buy from the girl who smokes it herself. That night after a good washing, they went into the pressure cooker to steam, which is what I do with old greens like this that might need a head start cooking before I toss them in the hot pan. I steamed them with slices of this wonderful bacon and a few tendrils of fresh young thyme. After steaming them under pressure for 5 minutes, they still had a their body but it was easy to pick through them quickly to pull out any hard stems that might not be good to eat. The leaves and soft stems came off cleanly. They were ready to be chopped and transferred into a pan of sizzling onions I'd gotten started on the side. I tossed them over high heat for a bit to get a little sizzle along the edges of the steamed bacon, then since we had a little time, I added a teacup full of that veal stock that I had recuperated from the pot on Saturday morning (always a habit to set a little aside for opportunities such as this) and put that on low to simmer and mingle while the baby got his bath. When things settled down, chopped spring chervil went in at the last minute and we ate simply with pasta, enjoying the haze of the heavy spring evening outside the window, thinking of the season, waiting for the rain to begin. Green leaves and good bacon , always a winning combination ! oh my... oh my. this entry alone is pure heaven. 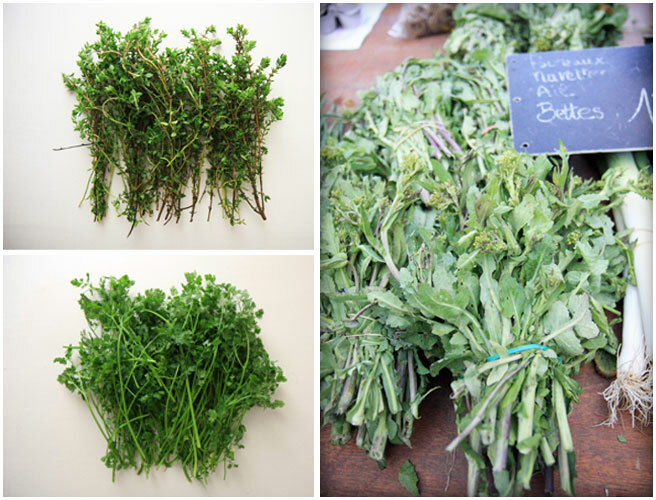 the market, the greens. the tip about the pressure cooker- and the winning dish and remarking on the seasonality of rain. thank you for stopping by my blog and allowing me to discover yours! It makes me smile to think of your cooking a "mess of greens" in your charming home, letting them simmer fragrantly whilst the little one plays in the tub.